I love breakfast, especially on days like today where my main concerns are what I'm going to eat and how long I can stay in bed watching TV before I start to feel guilty. Well I decided I wanted avocados on toast and that I could fit in a whole season of The Undateables before it was time to get out of bed and join society. I decided to add hummus, grilled tomatoes and pesto to my toast because I've had something similar in a restaurant before and it was quite simply amazing. I made my own pesto for this because the only one I can find that is vegetarian is super expensive and I'd rather have it without cheese, but store brought would also be yummy. Start by making the pesto, if you have a mini chopper/food processor then chuck it all in there and whizz away, adding olive oil little by little until it has a nice runny consistency. If you broke yours like me or don't have one, crush the nuts in a pestle and mortar, then chop the basil finely and bash it all together with the pestle. Slowly add the olive oil until it has a nice runny consistency then top off with a bit of salt and pepper and pop it to one side. Slice your tomatoes in half, then place them sliced side up on a baking tray, drizzle with a little olive oil, then cover them with a little salt and pepper. Place your slices of bread on the same tray, then pop it under the grill on a low heat until the bread is toasted. Flip the bread over and toast until brown, then transfer it to a plate. Pop the tomatoes back under the grill and whack it up to full heat to give them a good old sizzle while you construct the toast. Spread as much hummus as you like over the top of your toast, then top with the sliced avocado. 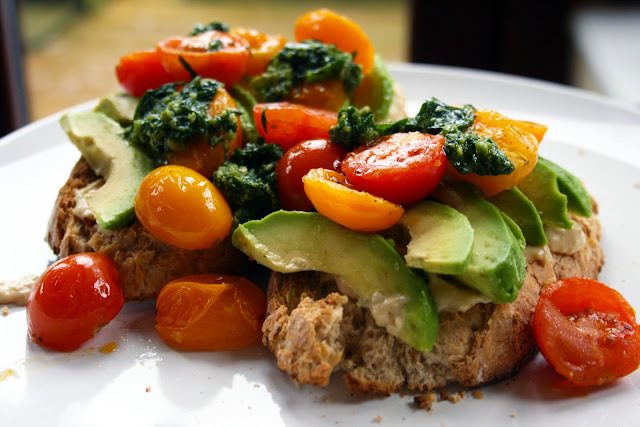 Remove the tomatoes from the grill and place them on top of the avocado. Dollop some of your pesto on, get back in to bed, put the telly on and enjoy!